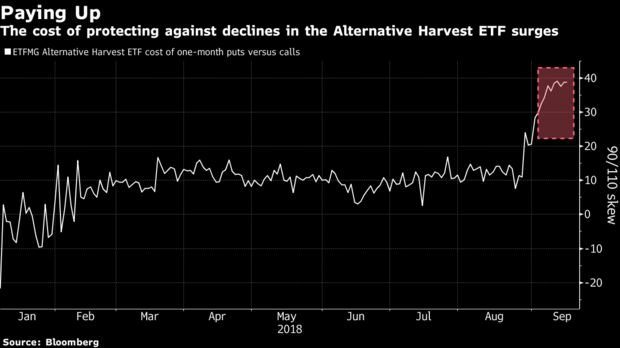 As equity investors caught up in the cannabis craze push pot stocks to record highs, options traders are paying the most ever to hedge against a comedown. 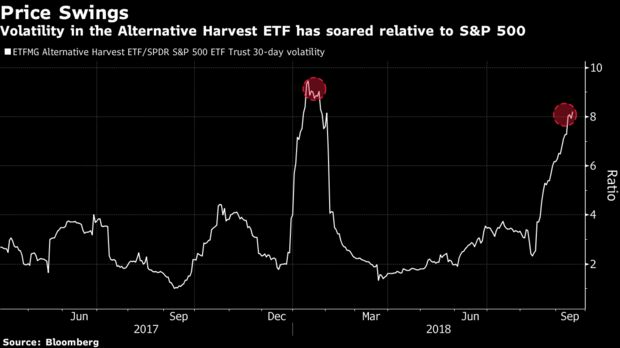 Skyrocketing marijuana stocks have pushed the $560 million ETFMG Alternative Harvest ETF, ticker MJ, up more than 60 percent since mid-August. At the same time, the cost of options to protect against a 10 percent drop in the fund has surged to an all-time high relative to those betting on gains of the same magnitude. The rally in the ETF, which last year changed its focus from Latin America real estate to cannabis-related stocks, comes as pot companies surge ahead of the full legalization of weed in Canada next month. Canopy Growth Corp., the ETF’s biggest holding, has doubled in value since mid-August when Constellation Brands Inc. announced a $3.8 billion investment in the weed grower. Tilray Inc., the fund’s third-largest holding, has increased more than 700 percent since its debut two months ago. The ETF rallied as much as 12 percent on Tuesday to $41.50, a record high, compared with a 0.6 percent gain in the S&P 500 Index. The pot fund’s 30-day historical volatility rose to the highest since January relative to the benchmark index. Tilray gained as much as 28 percent on Tuesday after the British Columbia-based cannabis company received approval from the U.S. government to import medical marijuana into the country for a clinical trial. The news lifted the entire sector: Aurora Cannabis Inc. climbed 7.3 percent, Canopy Growth advanced 7.5 percent and Cronos Group Inc. jumped 19 percent.